I’ll be honest and admit to having read a lot of young adult and teen books ranging from paranormal, to summer love, to more sensitive topics such as sexual identity, suicide, and acceptance. 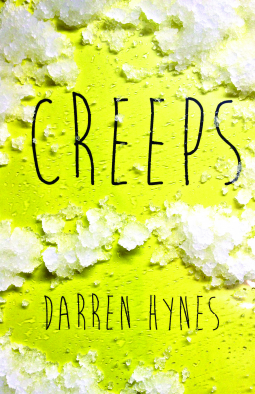 When I saw Creeps in our public catalog I knew I had to read it because once you get past the escapism that vampires, witches, and werewolves (oh my!) provide in this genre you’re left with real life problems that can shape a person’s life, and that is exactly what Creeps demonstrates. Darren Hynes sets the scene in a small coal mining town in Canada, and as you’re reading you can feel the large, grey coal cloud that always seems to be hovering over the town, and especially over Wayne Pumphrey. The symbolism of this greyness that just won’t go away is demonstrated throughout the novel as Wayne and the other supporting characters reveal their strained relationships with their families and each other. Fans of John Green and Laurie Halse Anderson will be engulfed by the relatable, yet heavy issues that arise in Creeps, as well as the down-to-earth characters that could be a placeholder for anyone in your life. I requested this title from the NetGalley catalog and read it on my Nexus 7 tablet using the Aldiko Reader app. *At this time the publisher is only granting access to long-lead media, reviewers, and booksellers in Canada.